The School of Music is a place where dedicated people make exceptional music, stimulate artistic growth, explore educational methodology and conduct groundbreaking research. We offer a broad selection of 38 degree programs from the baccalaureate to the doctoral level and have a strong commitment to reaching a diverse student population across our campus. 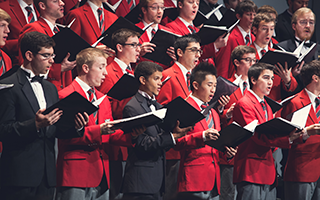 The School of Music is divided into eight distinct areas of study: Conducting and Ensembles, Jazz Studies, Music Education, Musicology, Orchestral Instruments (Brass, Woodwinds, Percussion, Strings, Harp), Theory and Composition, Piano and Voice. Undergraduate students will find a wide variety of majors available. The Bachelor of Music degree is offered in Performance, Theory, Composition, History and Jazz Studies. 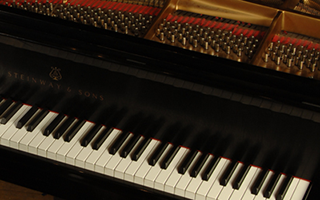 The Bachelor of Music Education is also offered, and enjoys a reputation as one of the nation's most well-respected programs. 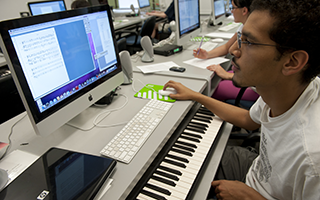 Students looking for a more flexible curriculum may opt for a Bachelor of Arts degree in music. The distinguished faculty, made up of 100 nationally and internationally recognized performers, inspired educators and devoted scholars, are committed to challenging our students to become all they can be. The faculty serves a student body of approximately 350 undergraduate and 125 graduate music majors, as well as serving the needs of as many non-music majors who are pursuing music minors, taking classes or participating in one of the many performance ensembles. For more information visit the School of Music website or view the university's major curriculum sheet on music education, composition, jazz studies, musicology, theory, performance-instrumental, performance-piano and performance-voice. Have a question about Music or want more information? Let us know. 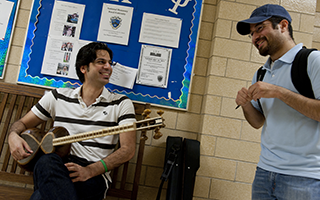 The Music Education program is one of the leading programs in the nation. With a long tradition of excellence in initial teacher preparation, graduate education, and professional development for in-service teachers, the program is known for a comprehensive, field-based curriculum that is rich in music methods and techniques instruction; an outstanding faculty of specialists; and an impressive record of accomplishments by its graduates. Music composition is the creation of new works ranging from pieces that sound conservative to the most avant-garde pieces, which may include non-traditional instruments, video images, dancers and lighting effects. Computers and electronic devices such as MIDI synthesizers are also frequently used in music composition. 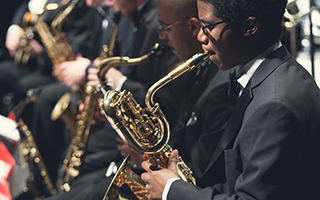 Jazz studies is a major that offers in-depth study in the history and literature of jazz, improvisation, jazz arranging and composition, jazz theory and pedagogy, applied music lessons in jazz and performance opportunities in both jazz combos and big bands. Music historians study, perform, and write about all kinds of music from all historical periods including the present. They study the history of Western art music (“classical music”), popular music and the music of folk cultures from throughout the world. Their goals include understanding musical styles and their cultural contexts. They also study a diverse range of music cultures. 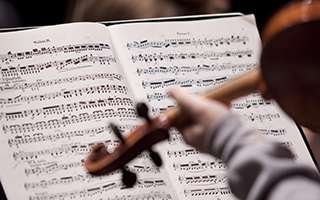 Music theory encompasses a variety of activities which all focus on understanding music. It includes such diverse fields as music analysis, the development of new theories of music and musical structure, history of theory, music perception and cognition, aesthetics of music, music theory pedagogy and computer-assisted music instruction. Students majoring are guided through a rigorous course of study in technique, performance practice, pedagogy and repertoire. All students are challenged to perform in the school's large performing ensembles as well as in the numerous small ensembles. Supported by classes in theory, ear training and music history, the keyboard area focuses on developing musicianship and piano skills. They focus on not only technique but also the development of a varied repertoire from all musical periods culminating in a public performance (i.e. degree recital). The program strongly emphasizes collaborative skills, for nothing develops listening and musical flexibility better. The vocal performance area is committed to providing the highest quality vocal instruction for both undergraduate and graduate students. Four full-time voice teachers, two choral conductors and an opera and lyric theatre director collaborate with expert pianists/vocal coaches and lyric stage directors to prepare students for a wide range of educational and performing experiences. 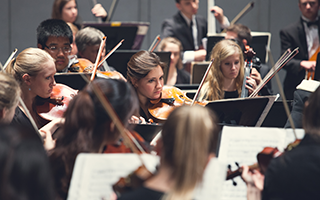 The School of Music recognizes the relationship that binds music to other academic and artistic disciplines and provides students with a comprehensive education, preparing them for professional careers in composition, performance, scholarship, and teaching. Faculty, students and guest artists present over 400 annual events, concerts and outreach programs, enriching the arts in the community and providing the university with all things musical, from ensembles like the marching band, jazz ensemble and glee clubs to classes for non-music majors who simply love music. Alumni have earned prominent positions and enviable reputations performing in the nation’s symphony orchestras, military bands and choruses, and chamber ensembles; teaching in conservatories, music schools, research institutions, and public schools; and leading individual careers as composers and scholars. Student and faculty ensembles regularly tour, commission, record, and are featured at national and international conferences, conventions, and professional meetings. Elements of music and musical notation; analytical concepts and terminology; fundamentals of counterpoint and melody; extensive practice through written drill and creative projects. The development of western art music from ancient times to 1700.